Billy Ward is a multi-award-winning session drummer and educator based in New York. I was lucky enough to study with him in 2007. In January 2017 (Just in time for his visit to NAMM), I built him a new website! Following the massive success of his acclaimed DVDs ('Big Time' and 'Voices in My Head') and book (Inside Out, The Mental Aspects of Drumming) I got back in touch with him at the beginning of the year, to find out if he had any advice on filming educational content. Billy completely changed how educational / information products are delivered, setting the bar for a new way of helping drummers. Due to a long break away from the educational scene, triggered by a series of unfortunate events, Billy was not focussing on his site. In 2016 he was ready to get back on the scene so I built a new website for him. 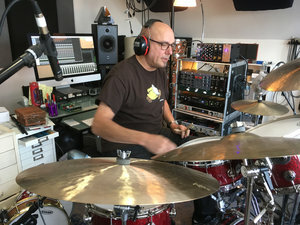 Here's Billy talking about drums, music, and life on Nick Ruffini's podcast Drummers Resource. Using one of my custom coded templates, developed especially for professional musicians, Billy is now 'mobile friendly' and able to edit and create the content on his own website without any need to learn how to code. By repurposing a chapter of Big Time, I created a lead magnet (free download) where he could reconnect with fans and gain new ones. This strategy completely aligns with Billy's giving mentality. We also created a survey to help Billy understand what people needed most. With that data, he is able to decide what to offer and how to offer it. I've helped him with that too. All of this has resulted in a mailbox full of requests for lessons and clinics. If / when he want's to teach, he has a line of drummers waiting for him who he knows already love his approach. His new website site is also ready to take payments for physical and digital products along with services when he's ready. Since launching the new site, Billy is back out doing clinics, blogging and has even reactivated his popular forum! If you're a musician or creative who would love to reconnect with an audience and grow a new one, but don't know where to start. I'd love to help you. Just get in touch and let's arrange a chat.